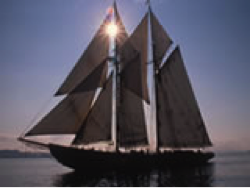 The original Bluenose was designed by William Roué and built by the Smith and Rhuland Shipyard in Lunenburg. 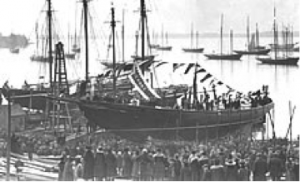 She was launched at Lunenburg, Nova Scotia on March 26, 1921, as both a working fishing schooner and a racing ship. This was in response to a Nova Scotian ship’s defeat in the International Fishermen’s Race for working schooners established by the Halifax Herald newspaper in 1920. The results of W.J. Roue’s efforts was a sleek looking craft, designed to meet the race rule specifications of 145 feet overall maximum length and racing trim water line length not exceeding 112 feet. 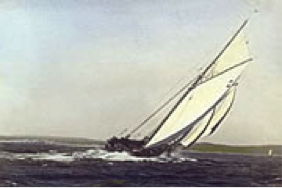 Bluenose soon proved to be an excellent sailing vessel and after a season fishing on the Grand Banks, she defeated Elsie (out of Gloucester, Massachusetts), returning the International Fishermen’s trophy to Nova Scotia. During the next 17 years of racing, no challenger, American or Canadian, could wrest the trophy from her. These racing successes earned Bluenose the title “Queen of the North Atlantic”. There was no rest for the champion. When her full sails were not speeding her to the finish line, they were racing her to the fishing grounds where she toiled as a salt banker. As Lunenburgers, and their country, faced the harshest of depressions, the Bluenose was a spirit lift, a beacon in an era of gloom. As she aged, it seemed she might fade away and in fact, when she met her watery grave hauling freight near Haiti in 1946, many feared it was the end of an era. 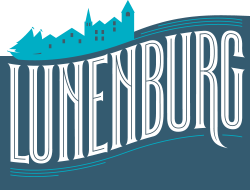 The Bluenose Exhibit in the Fisheries Museum of the Atlantic on the Lunenburg waterfront is not to be missed when visiting Lunenburg! In the early 1960’s the brewing firm of Oland and Sons was planning to build a replica of a Nova Scotia fishing schooner to help promote their new product, Schooner Beer. The result was Bluenose II, built from the original plans in the original shipyard by some of the same craftsmen who had given Bluenose her magic. The keel was laid on February 27, 1963, and she was launched on July 24 of the same year. Bluenose II was sold to the government of Nova Scotia for $1 and serves as a goodwill ambassador, tourist attraction in Lunenburg, and symbol of the province. Bluenose II is not allowed to race. It was decided at the outset that she would never jeopardize the reputation of the original Bluenose. However, ships will occasionally test her speed by assuming the same course when she is seen passing; like her namesake, she moves like the wind. Her interior however is very different, having comfortable quarters, a chart room and a spacious salon in the areas where salt and fish were originally stowed. The majestic image of the Bluenose has adorned the Canadian dime since 1937. She has been portrayed on three postage stamp issues including a fifty cent stamp in 1928 and appears on the Nova Scotia licence plate. The Bluenose legacy lives on in the hearts and minds of Canadians! For more information on the Bluenose II including the current sailing and visitation schedule please visit the Bluenose II Website.